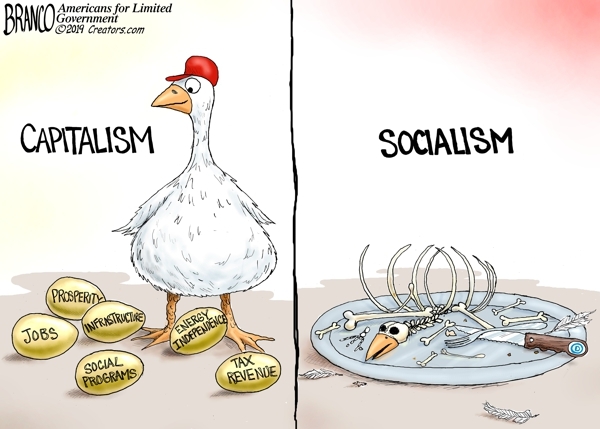 Socialism | What Did You Say? 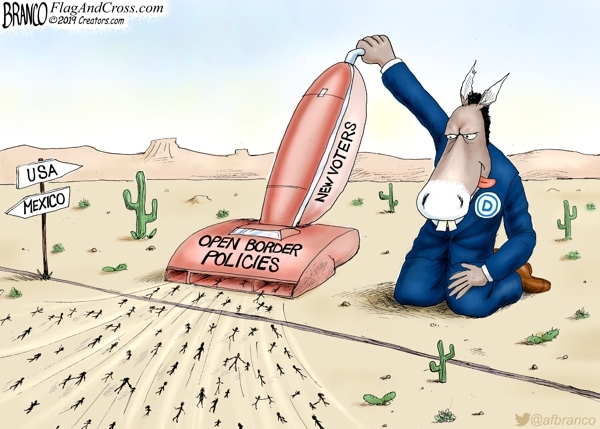 The Democrats have no desire to stop the flow of illegal immigrants coming across the border because they feel it gives them an endless supply of voters. 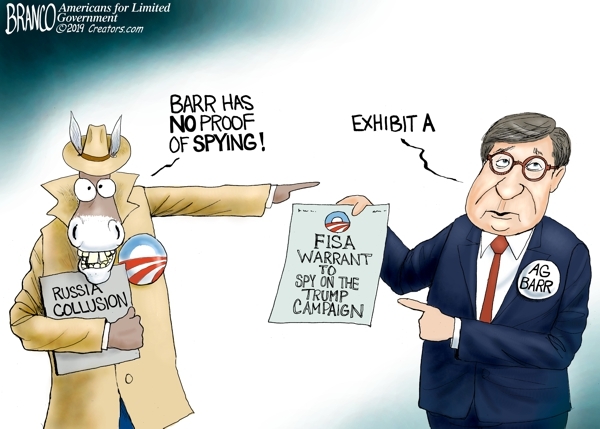 The Russian collusion investigation was started with no evidence of a crime now AG Barr will investigate why the Obama Administration spied on the Trump Campaign. Democrats say there’s no proof of Obama officials spying on the Trump Campaign, but the proof is the FISA warrants obtained for that very purpose. 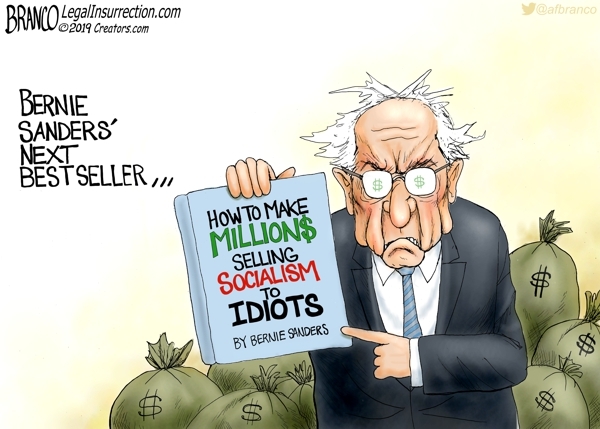 Capitalism has been very good to Bernie Sanders making millions writing books bashing the wealthy and propagating socialism. A.F. Branco has taken his two greatest passions, (art and politics) and translated them into the cartoons that have been seen all over the country, in various news outlets including “Fox News”, MSNBC, CBS, ABC and “The Washington Post.” He has been recognized by such personalities as Dinesh D’Souza, James Woods, Sarah Palin, Larry Elder, Lars Larson, Rush Limbaugh, and recently noticed and tweeted by President Trump. Vermont Sen. Bernie Sanders recently added some new personalities to his presidential campaign, and somehow he’s found someone just as crazy as he is. The newest player on Comrade Sanders’ team is David Sirota, a man who has been called a “Twitter attack dog” for his vicious assaults on Sanders’ Democratic rivals. And although Sirota was officially hired on as a speechwriter on Tuesday after advising the Sanders campaign for months, according to The Washington Post, his past behavior is putting him in a position that he may not be able to insult his way out of. In an article for Salon published March 6, 2013, Sirota gave a full and enthusiastic defense of Venezuela’s then-recently deceased President Hugo Chavez. American criticism of Chavez was, according to Sirota, simply a knee-jerk reaction to Chavez’s harmless socialist leanings. Sirota lamented the way Chavez had been transformed into a “boogeyman synonymous with extremism,” and touted the leader’s so-called economic miracle. The article didn’t age well. Six short years later, the only “miracle” people see in Venezuela is turning on a tap and getting a rare spout of running water. Sirota’s love of Hugo Chavez and Venezuelan socialism is certainly misguided, but forgivable. 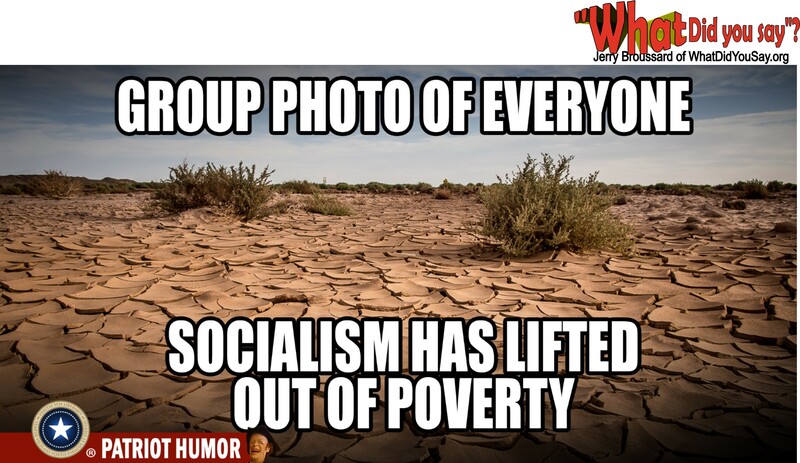 Most people who are interested in socialism usually give it up by the end of high school. It just takes some people longer to figure out the system is simply not rooted in reality. What is not as forgivable is Sirota’s ugly take on the Boston Marathon bombing of April 15, 2013. In an article for Salon dated April 17, 2013, titled “Let’s hope the Boston Marathon bomber is a white American,” Sirota was already hard at work stoking racial animosity and division while the nation was still reeling from a devastating terror attack. Of course, Sirota also prophesied what would happen if the attack turned out to be Islamic terrorism. In a twist of fate, the bombers were both white and Muslim, a contingency that was apparently not even on Sirota’s radar. If you thought Sirota was done making a fool of himself after a single article dragging race into the Boston Marathon bombing, you’d be dead wrong. An overreaction like, say, a commentator salivating at the chance to blame white Americans for a terror attack before the smoke has even cleared? While Sirota’s past writings may be extreme to everyday Americans, they seem to fit right in with Bernie Sanders’ insane rhetoric. If this is the troupe Bernie is assembling for his circus of a presidential run, we’re in for an entertaining election cycle. Jared is a husband, dad, and aspiring farmer. He was an infantryman in the Arkansas and Georgia National Guard. He has been an assignment editor for Conservative Tribune since 2017. 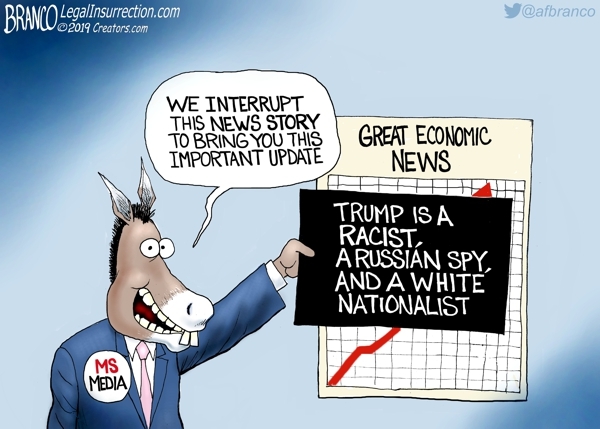 Mainstream media consistently bury good economic news that puts Trump in A positive light. 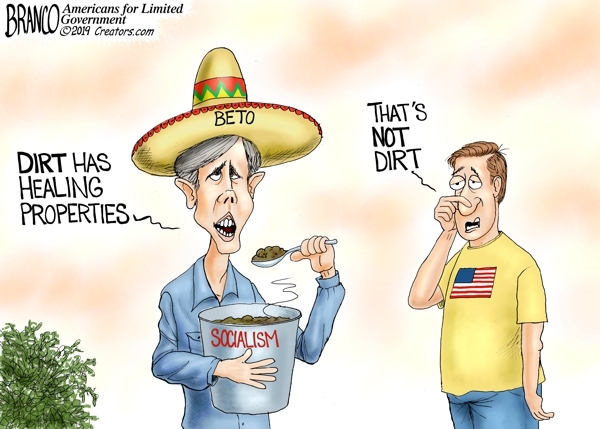 Among all the crazy things Robert (Beto) O’Rourke has done now add eating dirt to the list. A.F. Branco has taken his two greatest passions, (art and politics) and translated them into the cartoons that have been popular all over the country, in various news outlets including “Fox News”, MSNBC, CBS, ABC and “The Washington Post.” He has been recognized by such personalities as Dinesh D’Souza, James Woods, Sarah Palin, Larry Elder, Lars Larson, the great El Rushbo, and has had his toons tweeted by President Trump. This is a story about capitalism’s Golden Goose and what socialism will do to it if they ever get total control. a parasite that eventually eats the host. 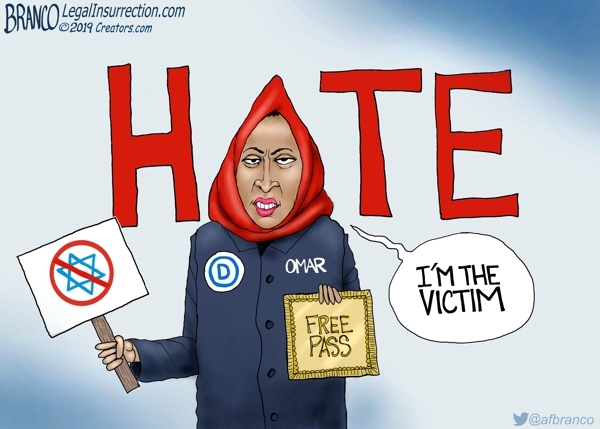 Ilhan Omar gets a pass and labeled a victim by the Democrat party for openly Demonstrating her antisemitism. 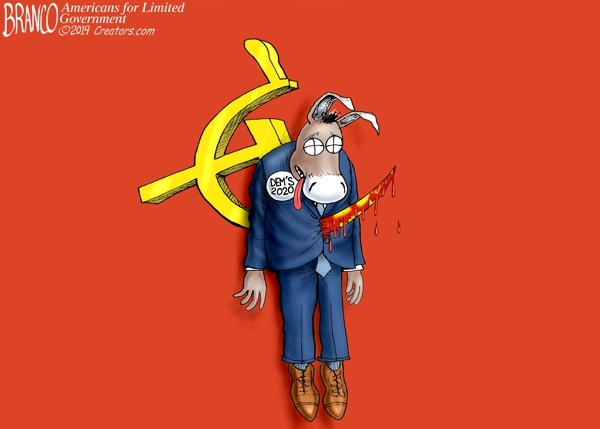 Communism/Socialism is Killing the Democrat Party. Many feel the party has moved too far to the tyrannical left for the American people. Do you think Democrats will push out Representative Ilhan Omar over her anti-Semitism? 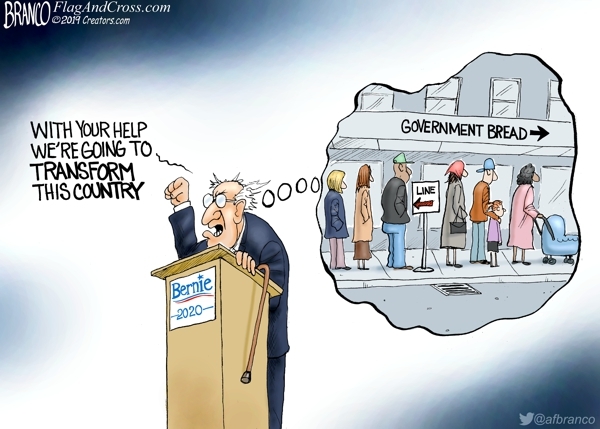 Bernie in earlier spoke fondly of bread lines in socialist/communist type countries and now promises to transform America when elected president. More A.F. 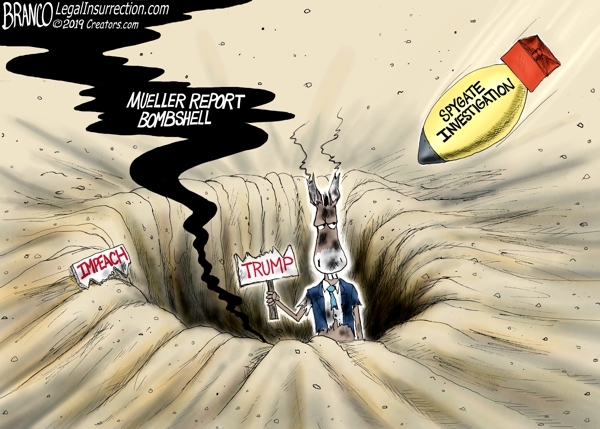 Branco cartoons at FlagAnd Cross.com here. A.F. Branco has taken his two greatest passions, (art and politics) and translated them into the cartoons that have been seen all over the country, in various news outlets including “Fox News” and “The Washington Post.” He has been recognized by such personalities as James Woods, Dinesh D’Souza Sarah Palin, Larry Elder, Lars Larson, and even the great El Rushbo. The old Soviet Union called the DNC and want their creepy clowns back. 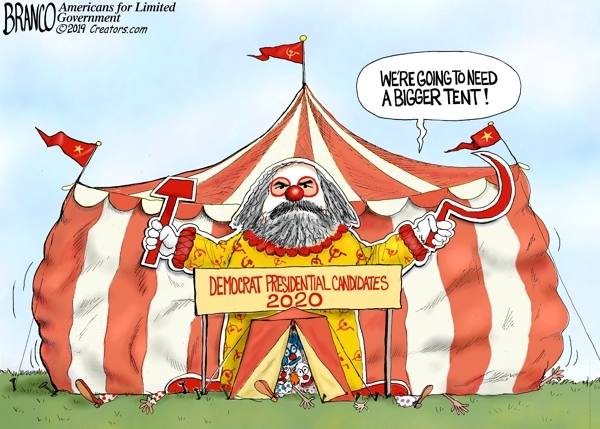 The Democrat presidential candidates are looking more like a scary circus act.